This is a very common dry skin complaint, that tends to affect young children. Those children who grow out of it may see it come back in later life. The symptoms vary from person to person, but the complaint is not catching. In fact, it’s believed to be passed on, as most people who suffer from eczema have a parent with the same condition. Some adults do develop eczema for the first time in later life, however, this is rare. In mild cases, the skin is dry, rough, red (inflamed) and itchy. Whilst in very bad cases the skin may be weeping, scabbed and bleeding. Constant scratching causes the skin to split and bleed and if left untreated this can also leave the wounds exposed to infection. Eczema is not considered to be life-threatening, but if left untreated you may develop complications from infections. And it has been known for the bodies immune system to overreact leading to anaphylactic shock syndrome, in extreme cases! The cause of eczema is not fully understood, but in our experience, it is usually triggered by daily activities and environmental irritants. For example, the overuse of chemical based products including moisturisers, makeup, perfumes and harsh soaps that remove the natural oils from your skin. Your Skin Care expert can help you identify your triggers and help you to manage your condition. Finally, eczema is currently not curable, but it can be managed, with a daily skin care routine and treatments. Our experience tells us that by using the right products for your skin. In addition to a good daily skin care routine along with regular treatments, the condition can be made more comfortable. 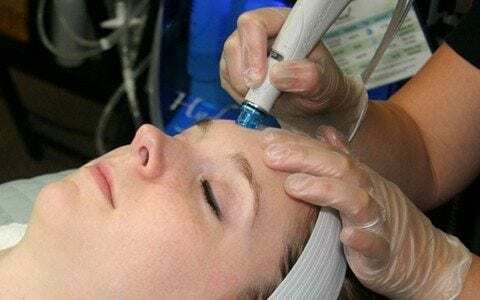 HydraFacial – This non-surgical procedure delivers instant results with no discomfort or downtime. The treatment initially removes debris and hydrates the skin while encouraging the natural replacemnt of oils. Red LED Light Therapy – An effective treatment for skin rejuvenation and healing. The Red LED light has a powerful anti-inflammatory properties that help reduce the imflamation in the skin and promote natural healing.